In 2017 the issue of 'holiday hunger' emerged as a significant and growing issue throughout the UK. We decided to take action to help tackle the issue in Huddersfield. We started by creating Kids Kitchen Club partnering with a local school to offer food and fun activities for children and their families daily throughout the Easter school holidays. For the six week summer holidays, we wanted to be able to help even more children, and that meant changing our approach. During the summer term, we contacted all of the schools in south Kirklees, inviting them to access Holiday Hunger support for their families, during the summer holiday, through our Feeding Families Programme. 21 schools took part in Feeding Families. 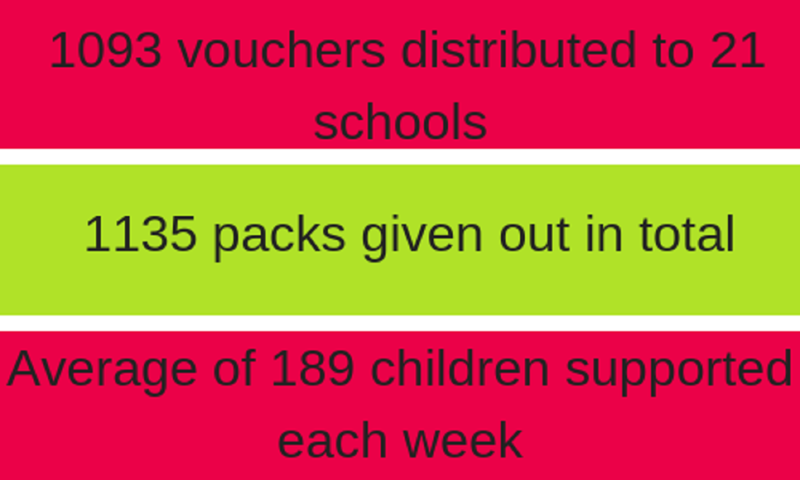 We provided these schools with special vouchers to distribute to families with free school meals. The vouchers meant families could receive food packs with breakfasts and lunches for each of their children, for each week of the summer holidays. Families then visited The Welcome Centre weekly throughout the 6 week holidays and exchanged their vouchers for weekly food packs containing: bread, butter, cheese, tuna, soup, jam, cereals, milk, fruit juice, fresh fruit, and crisps/ biscuits. The project was funded through a community fundraising appeal. The appeal raised more than £7,500, all of which was spent during the project. Without the generosity and kindness of individuals in Huddersfield, we would not have been able to provide this essential support to families in need. And hundreds of children would have gone hungry during the holidays. In 2019, we'd like to build on the success of our pilot Feeding Families Programme, and deliver support a greater number of vulnerable children.